Tusk First Line Air Filters make great replacement filters for your OEM air filters. High-performance filtration and flow is achieved by using high-quality, 2-stage, polyurethane open-cell foam technology that features a "three-dimensional" cell structure for uniform porosity. Dual stage filtration with 45/65 PPI (pores per inch) means the outer foam layer has larger pores to maximize surface area to prevent dust from clogging the filter, while the inner layer’s smaller pores maximize filtration so particles can’t get through. Bottom line, these air filters provide superior filtration while maintaining maximum airflow! Each filter features a thick, flat, sealing foam ring to seal tightly to the air box. Think Tusk for all of your motorcycle, ATV, and UTV performance needs! Constructed of a 45/65 PPI (pores per inch) dual-layer, high-quality foam to offer maximum airflow while catching even the smallest dirt particles. Features a thick base ring to seal tight against the air box. Open-cell Polyurethane foam technology brings the ideal solution of protection and performance. Can be used with any foam filter oil (does not come pre-oiled, must oil before installation). Fits my CRF230 as stated and seems to work well. Time will tell. not one complaint on these filters! Another good quality Tusk part. This air filter is on par with major name brands. Oiled it up and it fit perfectly. I expect it to last as long as any other and I saved money for other parts/upgrades in doing so! I was worried about using a cheaper aftermarket air filter and hesitated buying this for a while, but it looks as good as the high priced filters and fit perfect. If not, I would not use it. Fit great and seems good so far! I will have to see how it holds up to repeated washings. Good quality, and affordable!!! Would purchase more tusk products, quick and easy shipping. I bought several since they are less than half price of name brand filters. I've washed in stoddard solvent and they seem to hold up well. No issues. Tusk filters are easy to change and fit great. Easy to switch out from the stock filters. This is my first time to give Tusk air filters a go. The reviews were mostly good. Once installed it seemed to be a little larger than the existing air filter but I dont see any areas of concern. Good aftermarket filter for the money. The fitment to the cage varies a little - I bought 4 of them for my 450XCW, and experienced 1 out of the 4 was irregular (hence the 4 Stars) just be sure that the foam sealing surface covers that cage uniformly before installing onto the bike. Felt as good as a twin air, anxious to see how it holds up. At this price I can afford to keep a spare. Great filter for the price.. would be nice if they came pre oiled. They do work well with no toil , maxima fab 1 and bell ray oils.. $12 though, I’d like to see them pre oiled - same price can get maxima filters pre oiled however they don’t seam to be as durable as the TUSK filters. I bought this as a second filter to pack in the truck or bags for weekend rides. It is substantially thinner than a Twin Air, and it is a much tighter fit on the basket. But, seems to keep the dirt out well. I wouldn't run this as my primary filter, but as a back up or second-day filer, it works great. Works exactly as described. great value. Tusk air filters fit well, have a long service life, and their cost is reasonable enough to keep spares on hand. I've used them in both new and old bikes. I service them with traditional petroleum-based cleaners and oils and have had no issues. 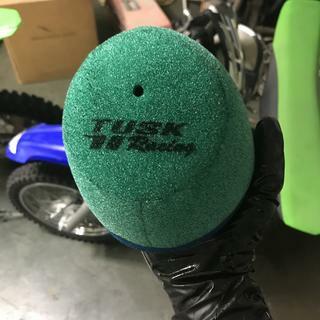 Purchased Tusk Filters for my 91 KX500 that’s raced in VMX events down under in New Zealand. Consider them to work excellently in a variety of conditions from heavy dust to mud. Well made,good longevity via frequent cleaning,hold shape & Seal well. Well pleased with product. In addition the Rocky Mountain freight/courier delivery service via DHL Express is in my view Superb. ... just 6 days to deliver to my doorstep in NZ. That’s impressive! Cheers. Matt. Don’t spend twice the money on other brands when this filter looks and performs exactly the same. These are my new go to. Great quality air filter at a great price! You can stock up on a couple of these and have clean filters to ride with every time! These can be washed several times before breaking down. Thanks Rocky Mountain and tusk! These things are amazing. They keep the dirt out of my engine. As good as no toil, awesome filter. Did a very dusty ride and zero dirt made it through the filter. I use my no toils oils it. Comparable to other aftermarket basic filters. Fits well, no issues. When I first received the filter I was concerned about the fitment because it looked a little different shape than the original; Twin Air filter. After installing it on the cage it seems to fit very well and seals to the intake housing well also. The foam material seem to be good quality but only time will tell how good it will hold up. As far as price goes I got two filters for less than the cost of one Twin Air so even if it doesn't last quite as long as the Twin Air its still a good deal. I haven't had a chance to ride with it yet but after my first ride I will check for any dirt inside the intake box but I do expect the performance to be similar to the Twin Air. Good product. Almost same a Twin Air that it replaced. Time will tell how well it will hold up. If they were orange in color, you'd pay twice as much. The filter I received appears to be made from virtually the same materials, and the same process, as other more expensive brands. I would've bought two right away, but I had already purchased an orange one. Buy these air filters!! These are a good value filter and there are no issues with fit or operation. I have a few extras and clean and rotate them out as needed. Works as good if not better than twin air at half the price. Great product, love it for my kx 85 2017 that I ride for fun when I want to take a break from the 250. Has a big sealing surface and works like other filters. I found that using twin air oil is great just fully submerged it in the oil and squeeze out excess. Also fits air filter cage well. Good quality and most importantly great fit. Priced realistic since it goes in a kid bike. Same material as it’s identical “twin”. The air filter does not care that it’s name is Tusk. Great price for a new filter, seems to be holding up as good if not better than other brands I've tried. My only complaint is that mine did not come with the rubber grommet for the center bolt. This wasn't a huge deal as it's possible to take one from another filter, but it would have been nice to have this come standard like other filters do. good to have in the draw as a spare, not sure how long they will last but have been fine so far. I use twin air as my primary but for spare and shorter not very dusty rides these are fine. I also use the twin air dust cover for extra protection whenever we ride. High quality filter for the price. Fit my 2002 yz250 perfectly. is comparable to filters of higher price ranges. Works great , last a long time. I run these on all my bikes . they are a great value , fit perfectly. And I have never had any iss6 with them. Will this filter hold up with No-Toil regular air filter oil? BEST ANSWER: I use No-Toil and I have these filters in all 6 bikes I own haven't had a problem yet. I have used several different air filter oils and cleaners and they hold up great. been rotating 3 of them between cleanings for over 6 months now and they are holding together as good if not better than the Twin Air I used to use. we have had great reviews on these filters. they work well and a lot of racers use them. i personally use them for desert racing and have loved them. thank you for your question. Yes, like any other filter they work just fine with No Toil. I have used Bel Ray, No Toil and PJ1 and all have been fine using the Tusk filter. It has held up well to multiple cleaning and oilings with the no-toil system with no adverse issues. Yes, I have cleaned and oiled with No-Toil 3 or 4 times so far holding up great. Don't know. I oiled it with no -toil but can't use because it is too small. Its better & more durable! Note- its not pre-oiled. I have used it on mine. No issue at all. Is this a direct replacement filter or does the bike need to be modified? I have a foam prefilter the goes around a metal can shaped filter sides with a metal spring retaining it to the duct. BEST ANSWER: It's a direct replacement. It goes over the plastic frame that screws in. This way you don't have to deal w/ the mess of cleaning a dirty, oily, greasy filter. I buy them for my YZF450, YZ250, and CRF150. if you order the bike specific filter it should be a direct replacement without modification. I have these for 4 different bikes without issue. Not sure what you are using them on but I use them on kx and ktm dirt bikes and they fitted with no modifications. 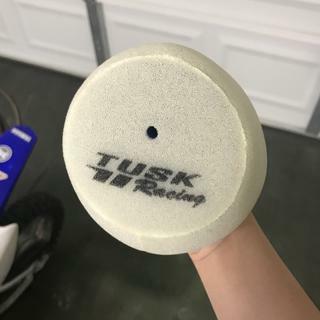 for the tusk air filters? BEST ANSWER: klotz spray on cleaner works good for me. i spray some on to dissolve the filter oil, then use dawn soap to fully remove all oil/grease/cleaner from the foam. Not sure about recommended, we just always used gas and let it dry overnight then oiled. 5 years of my boy racing and never a problem. Is this filter flame resistant? BEST ANSWER: I personally have had no issues with flammability of this filter and I do not use a backfire screen. I believe it actually has a lot to do with the oil that you use. A high flash point oil like Maxima or Bel-Ray gives extra protection I think. I have never directly exposed it to flame but I would imagine that after you coat it in oil it is no longer flame resistant if it ever was. Not sure, I use gas to clean it and its never caught fire so I'm not sure if its flame resistant. Will this work on 4 strokes with the backfire screen removed? BEST ANSWER: Thank you for your response. 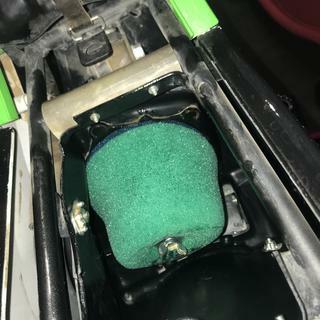 On 4 strokes there's a backfire screen on the air filter cage that is restrictive..I do not use a stock cage, I get more airflow.. But by using these types of cages you have to use a spark resisting filter. But yes, I do run a spark arrestor on my exhaust as well. if your referring to the spark arrestor, then yes. but id recommend leaving the spark arrestor in if you don't want a ticket or to start a fire. Yes works on my 2013 Honda CRF450R. Does this filter come with the end pieces for a Yamaha Warrior 350 or do the stock ones have to be used? BEST ANSWER: Not sure on this filter, as I'm not familiar with the 350's own filter. Does this liter fit my 2017 Ktm xcw300? Are these filters flame resistant? I am currently using a not-toil high flow filter cage which doesn’t have a screen. BEST ANSWER: they are not flame resistant.